Relaxing, inviting and attractive all apply to describing the design of the Amish Hoosier Bar Stool. The Hoosier is handcrafted at an Amish wood shop in northern Indiana. The utmost care goes in to this country style furniture, with beautifully turned legs, a wavy chair crown and supportive and stylish spindlework. The Hoosier emits warmth at your kitchen counter or bar, and is sure to bring family up to the counter where they can sit in comfort every time. 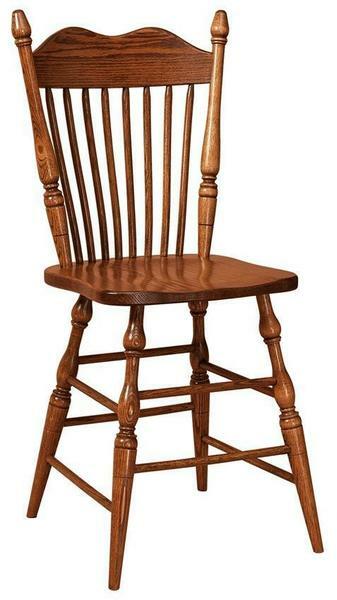 The full wooden knobs that top the chair bring out the details that stand out with fine Amish furniture designs.